Become a Certified Health and Wellness Coach. By taking this course, you will have completed 12 hours toward certification as a Certified Health and Wellness Coach. What is your personal definition of wellness? What will it take for you to live in wellness? How will you know when you are there? 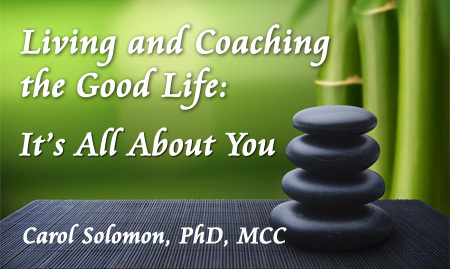 So begins the “Living and Coaching the Good Life: It’s All About You” Master Class. 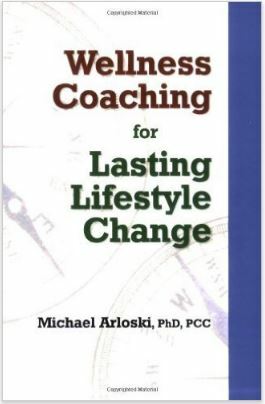 This class has been developed specifically for coaches to learn and live the principles of wellness by creating and using a personalized wellness plan. You will be exploring and deepening your understanding of your own needs, values and goals through use of exercises in awareness, visioning and goal-setting. Together we will embrace the psychology of possibility as we delve into the necessity of fun, connectedness, meaning, and contribution. This class explores the integrative holistic models of wellness coaching, definitions and wellness principles designed for lasting lifestyle change. Have you ever wondered what mindfulness truly is? One of the goals of mindfulness is getting to know ourselves at a deeper level. In terms of wellness coaching, the goal is to learn to integrate what the medical world knows to be generally true with what we know or can learn about ourselves. Research shows that self-compassionate and mindful approaches help to increase motivation, enhance coping and emotional wellbeing, reduce anxiety and depression, promote health behaviors, and maintain healthy habits. In this class, you will learn how to use visioning, self- compassion and mindfulness skills to reduce emotional reactivity and increase your circle of compassionate and mindful support. This class will be down-to-earth and practical. Assessments will be used to track individual progress. There will be weekly homework with partners as well as a live interactive listserv for class interaction. We will examine cutting edge research by reflecting on the works of top neuroscientists, physicians and psychologists such as James Prochaska, Ellen Langer, Kristin Neff, Jon Kabat-Zinn, and Andrew Weil. Learn to design and implement your own wellness coaching plan. Integrate core awareness, mindfulness and self-compassion exercises into daily life. Learn skills to help yourself and clients bridge the knowing-doing gap. Create and design wellness strategies based on assessments. Identify and transform difficulty and resistance into ease and wellbeing. Develop deep partnership with clients in the wellness process. Learn to motivate yourself with kindness and self-compassion rather than self-criticism. Identify and use skills to deal with stress, vulnerability, overwhelm and self-defeating behaviors. Learn how to s-l-o-w down, self-connect, and incorporate wellness changes necessary to enjoy the good life for self and clients. Learn to become an authentic model of wellness committed to continued deep self-exploration and self-development. 6. Open to All The Living and Coaching the Good Life Master Class is open to all, both within the MentorCoach Community and without. This class provides twelve hours toward Certification as a Certified Wellness Coach for students meeting the attendance requirement. This class also provides twelve hours toward MentorCoach Certification as a Certified MentorCoach as an elective for students meeting the class attendance requirement. It can also provide 12 hours toward ICF Certification via an Accredited Coach Training Program such as MentorCoach or via the ICF Portfolio Approach. This class is also approved for 12 CCEs from the International Coach Federation for students meeting the class attendance requirement. There is no fee for ICF CCEs. To receive credit for CEs, students must pay the CE fee and be present for 9.5 hours. However, to receive credit for CEUs, ICF CCEUs, credit toward MentorCoach Certification, or to receive a Certificate of Completion, you must be present for 9.5 of the 12 hours. Listening to the class by recording does not count toward the attendance requirement for Wellness Coaching Certification, for receiving CEs, credit toward MentorCoach Certification, ICF CCEs, or a Class Certificate of Completion. With 25 years’ experience in helping people find solutions and make positive life changes, Carol is a natural teacher and coach. She loves to help people identify and use their strengths to incorporate a healthy lifestyle, decrease stress, lose weight and strengthen their wellness resources. Throughout her career, Carol has worked closely with pediatricians, primary care physicians and integrative health care providers and has been on the staff of 3 hospitals. Her coaching career began as an author of a book about how to stop emotional eating and lose weight without dieting. She is one of the world’s leading experts on using Emotional Freedom Techniques (EFT) for weight loss. Carol believes that coaching at its core is wellness oriented. No matter what you are focusing on, you will never perform at your best if health and wellness are not high priorities. She encourages clients to take responsibility for their own health, look beyond obvious problem-solving strategies, and master new habits and skills over time so they become automatic. Working on wellness issues allows clients to be more productive and feel better and more confident in every area of life. Carol has a warm and genuine personal style and an enthusiastic love of learning. She enjoys a thriving coaching practice and is passionate about helping others succeed. Carol is a licensed clinical psychologist and ICF Master Certified Coach (MCC). She was one of the first MentorCoach Foundations Trainers and routinely received rave reviews. (She is a member of Ben’s elite MentorCoach Trainer Team Hall of Fame.) Carol presented on the MentorCoach Alaskan Cruise and at a plenary session of the MentorCoach Conference in Bethesda and has taught dozens of classes over the last 15 years.